One section of Before Now in 99 Plymouth’s entry gallery. Brooklyn Bridge Park (BBP) is pleased to welcome Before Now, a new, site-specific installation by artist Priscila De Carvalho. The Brazilian-born, New York-based De Carvalho took inspiration from the park’s natural and built environments as well as the area’s history to create the original work. 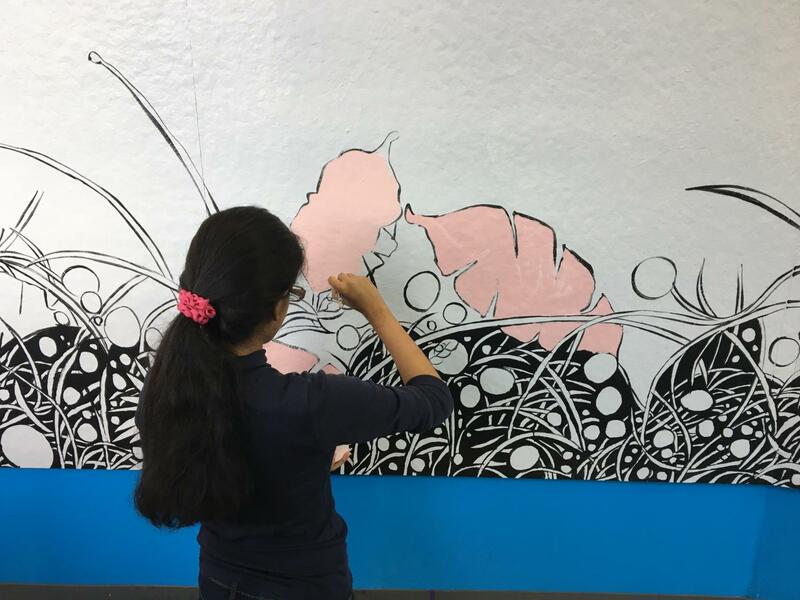 The installation consists of intricate, colorful murals along the walls of 99 Plymouth’s entry gallery, as well as captivating light box drawings displayed in its Community Room. De Carvalho tests colors for Before Now. De Carvalho’s artwork combines influences from Pop Art, monumental murals, documentary photography, and architecture. In many of her pieces, she contrasts urban and natural imagery to examine humanity’s place in a changing world. She based Before Now on the relationships between nature, the built environment, and the past. Combining floral and architectural elements of Brooklyn Bridge Park, De Carvalho shows how the natural world intersects with and weaves through the urban environment over time. In the Community Room, she created light box paintings that depict lush, overlaid images of the surrounding landscape. De Carvalho drew and painted Before Now with assistance from Brooklyn High School of the Arts students. Before Now is the latest entry in a rotating program of original works by local artists hosted at 99 Plymouth. 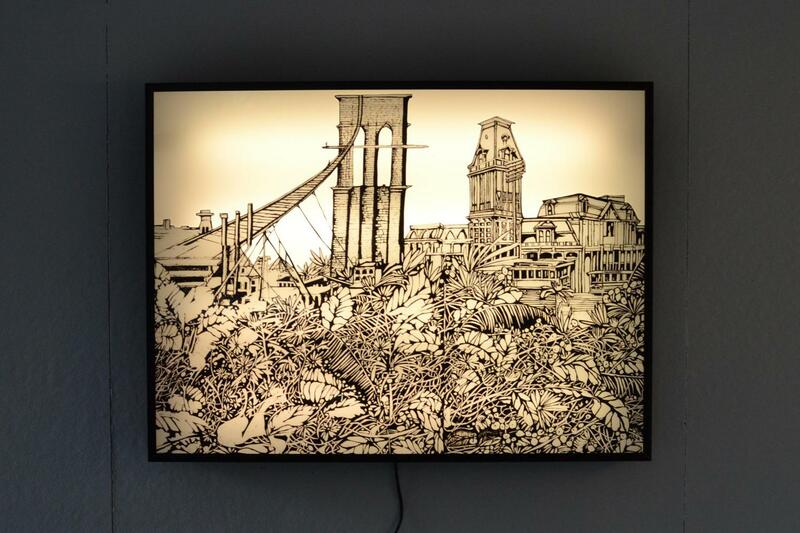 Later this year, BBP will welcome Twenty-Five Hours by artist Jesse Chun, which will reinterpret historical facts and scientific data about the Brooklyn waterfront and East River tides into text-based drawings, and works on paper. The talented young artists of the Rush Philanthropic Arts Foundation Summer Session will also return to 99 Plymouth this summer. They will work in the style of Rush Director of Education Meridith McNeal, whose colorful paintings of windows invite the viewer to examine both what is outside and what is within them. Before Now will be on view until early April 2017. 99 Plymouth and its Community Room are open from 8:00am to 11:00pm daily. One of the light boxes in 99 Plymouth’s Community Room. 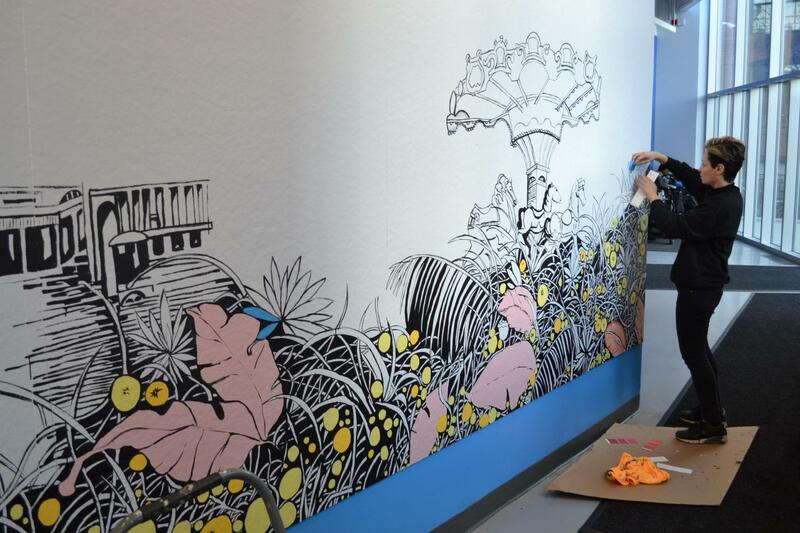 Priscila De Carvalho is a New York-based multidisciplinary artist whose works include paintings, drawings, sculptures, murals, site-specific installations and permanent public art. Her visual narratives incorporate urban environments alongside social, economic, and political commentary. She is a recipient of the Pollock-Krasner Foundation Fellowship Award and the Sculpture Space Fellowship Award. She has been an artist-in-residence at Lower East Side Printshop, Socrates Sculpture Park, Jamaica Center for the Arts and Learning, and Sculpture Space. The artist has exhibited at Basque Museum-Centre of Contemporary Art, El Museo del Barrio, Socrates Sculpture Park, The Museum of Contemporary African Diasporan Arts, The Bronx Museum of the Arts, Grand Palais in Paris and various other galleries and museums. 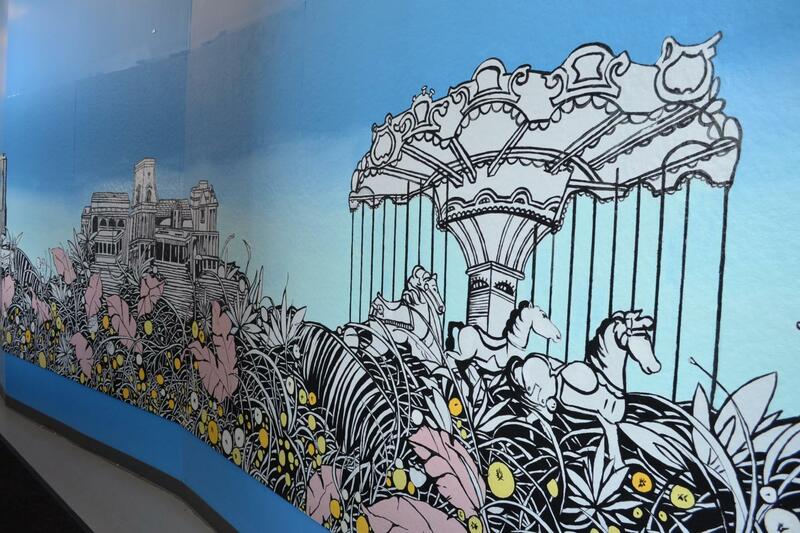 De Carvalho’s permanent public art has been installed in the New York City subway, commissioned by the MTA Arts and Design program, and at Richard Rogers Public School, commissioned by Public Art for Public Schools. To learn more, visit prisciladecarvalho.com.